Properly organized files mean an efficient system, allowing your employees to handle clients seamlessly without wasted effort. Efficiency also comes from being able to send documents directly from the software. No need to print a document just to put it in a fax machine. Employees no longer have to pass a paper file from desk to desk — changes are entered into the software and are available instantaneously to all employees. You can coordinate all parts of the loan process directly from the ATLOS system. When it is time to interact with your clients, the ATLOS system can create documents for client approval, and you can transmit those documents directly to the client for digital signatures. No more waiting for the paper mail to show up, or risk losing a document in transit. If you use more expensive couriers to deliver documents you have that added expense to your business. Paper loan files must be secured and stored for long periods. This can be an excessive cost if your business doesn’t have secure on-site storage. You have to pay a security company to store the files elsewhere, with the problems of finding the data easily later if needed. The ATLOS system is highly secure using sophisticated algorithms to keep your client data safe. 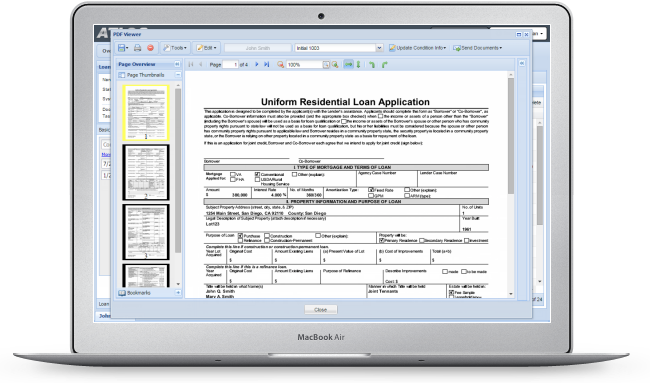 You can retrieve information whenever it is needed without having to search paper files. Paperless loan processing software from ATLOS is the answer to keeping your loan data secure while improving the efficiency of your business. Contact us today and start the process of taking your loan business to a paperless system. Your employees and clients will thank you for it. This entry was posted in Paperless Lending Solutions, Paperless Loans, Paperless Mortgage Software. Bookmark the permalink.